Very often web designers encounter the need to spice of their websites by playing with CSS opacity for backgrounds, texts and images to build modern subdued styling effects. Opacity is also extensively utilised in creating a subtle shadow effect on text and boxes to make a webpage more attractive for users. This can be achieved either by using the CSS opacity property or by using RGBA colour, each way has its own merit and shortcomings. We will explore some of their most popular practical uses and cross browser compatibility solution to make them work on legacy browsers like IE8 and below versions that offer either partial or no browser support altogether. 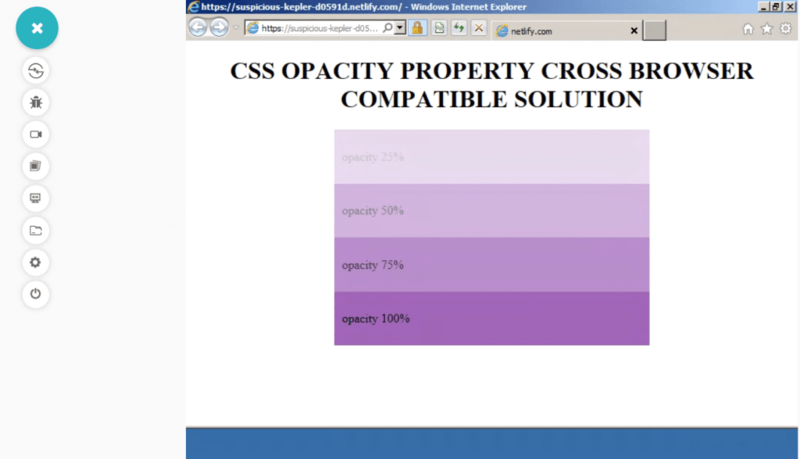 The CSS opacity property is used to set the opacity value for an element. It defines the level of transparency by the use of a number in the range 0 to 1, where 1 corresponds to 100% opaque (or 0% transparent) and 0 corresponds to 0% opaque (or 100% transparent). However, CSS opacity property will add the specified transparency level to the entire element including all its child elements as well. For eg- if opacity property is defined for a div element, then all the elements inside the div which could be some text, image or other divs will also gain the same opacity from the parent div even though opacity isn’t explicitly inherited. Before we deep dive in this article, you may have a look at the sample code I used to represent CSS Opacity for background on one of our LambdaTest Experiments, here you can visualize the output with respect to the difference in CSS opacity value. 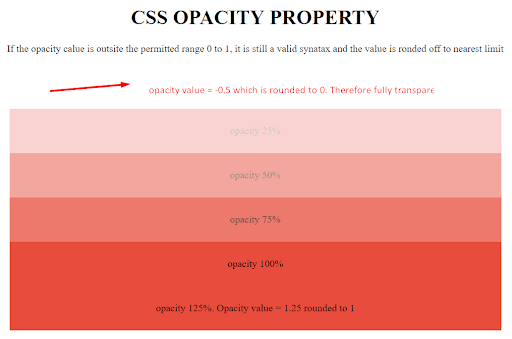 Note: If CSS opacity number is set to a value that is outside the defined range 0 to 1, it is still a valid syntax. The value is rounded to the nearest limit point. For instance, if CSS opacity is set to -0.5 it will be rounded to 0. Similarly, if CSS opacity is set to 1.25, it will be rounded to 1. CSS3 provides a short single line style rule to add CSS opacity for background color, which is supported by all modern browsers. However, earlier due to cross browser compatibility and feature support issues, making CSS opacity work was quite cumbersome, and required extensive browser specific rules and fallbacks shown below. To access my webpage on legacy browsers I have performed browser compatibility testing using LambdaTest to ensure that my code renders as intended. LambdaTest is a cross browser testing tool offering more than 2000 real browsers and browser versions running on numerous operating systems. For this experiment of CSS opacity for background color, I used live-interactive feature of LambdaTest called Real Time Testing. Real time testing helps you to interact with your webapp across thousands of browser and browser versions by running a virtual machine, hosted on LambdaTest cloud servers. I also made use of Lambda Tunnel, which allowed me to test my locally hosted webpages on LambdaTest platform by establishing an SSH(Secure Shell) connection. If you look at the code below, you will get an idea on how cross browser compatibility for CSS Opacity was utilized in earlier days. But it is quite evident that this is not a practical solution for modern use. Today, there is a short modern hack for making CSS opacity work for all browsers including legacy versions of Internet Explorer – IE6-IE8. The code mentioned above will not work in IE, specially in IE8 if ‘zoom :1’ is not specified. IE doesn’t apply several CSS style rules to elements that don’t have layout. ‘zoom:1’ or ‘width :100%’ will trigger – “has layout” for the element and enable CSS opacity for background color or images to be applied. The final solution in our quiver for fixing cross browser compatibility issue with CSS opacity for background and images, is a small polyfill which adds support to older IE versions IE6, IE7 and IE8. Using this polyfill eliminates need to worry about vendor prefixes or fallbacks as far as IE legacy browsers are concerned. However, note that this polyfill will not work for inline CSS style rules. Use IE conditional statement to load polyfill JS file in Internet Explorer IE8, IE7 and IE6. This will not be interpreted by any modern browsers and will be simply discarded as a comment. If you want to learn more about IE conditional statements and CSS feature queries, check out my article here. CSS offers another alternative to CSS opacity to achieve a similar kind of opacity or transparency effect by the use of RGBA color. This is quite popular for creating overlay backgrounds, gradient backgrounds, text and box shadow, gradient text etc. One fundamental problem with CSS Opacity property is that if specified for a parent element, it affects all children element as well. If you set background of a div element to transparent, then all children elements (like text and images) of the parent div will also be set to transparent. This is where RGBA color comes to our rescue. 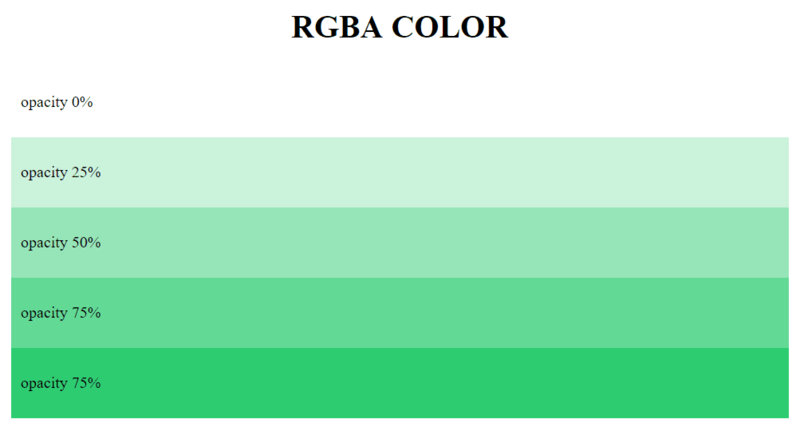 The RGBA color value is similar to RGB but with an alpha channel which specifies opacity or conversely transparency value for an element but leaves its children untouched. R/B/G: Specifies the value or intensity of Red, Blue and green colors respectively either by an integer value ranging from 0 to 255 or % value ranging from 0-100%. Alpha-channel : species the opacity value as a range between 0 and 1. 0 represents 0% opacity(or 100% transparency) and 1 represents 100% opacity(or 0% transparency). You can refer to our LambdaTest Experiment on RGBA Opacity background color property. Below is the code sample used for the cross browser compatibility experiment on RGBA Opacity. 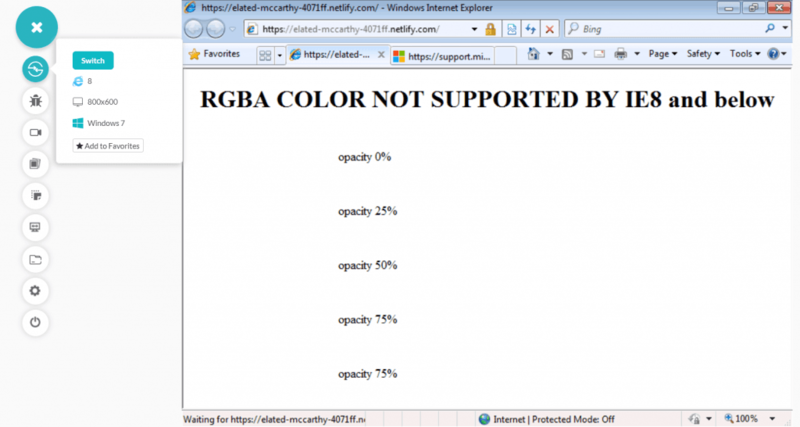 Although RGBA color enjoys excellent support across all major browsers and is largely cross browser compatible. However noticeable exceptions are IE6 – IE8 which do not support this feature. One solution is to use a fallback solid color(100% opacity) without any alpha value, ie without any opacity/transparency value. Browsers which do not comprehend RGBA value will render the fallback color. However we will explore ways to make RGBA cross browser compatible and work in IE6-IE8 versions as well. 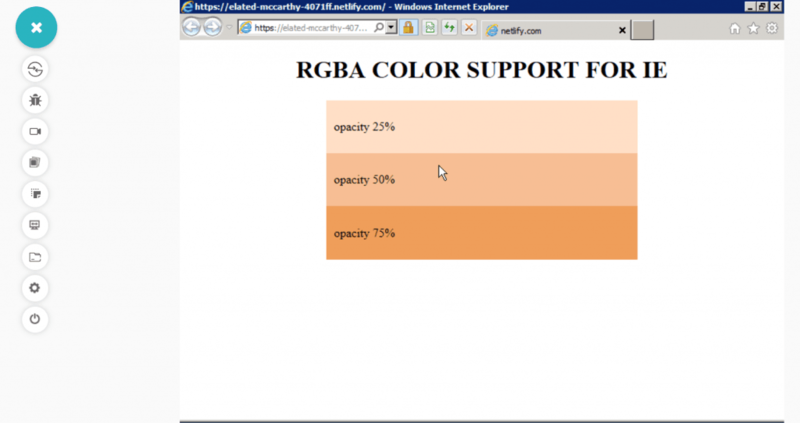 Microsoft Internet explorer (IE6-IE8) had its own own gradient and filter properties which is slightly different to RGBA. It rather uses 8-character HEX value called ‘ARGB’ (alpha RGB) to define colors with a transparency value. Unlike traditional RGBA which is 4 character long, R,G,B values ranges from 0-255 and alpha channel value ranging from 0-1, #ARGB has a hexadecimal format with first 2 – #AARRGGBB. First 2 characters specify the alpha value and control the opacity(00-FF) while last 6 characters specify the red, blue and green color intensity respectively. Here’s a table showing alpha value in % and its corresponding alpha value in #ARGB format – If you have RGBA value – rgba(F,0,0,0.5), then the corresponding value in #ARGB format will be #80FF0000 where first 2 characters ‘80’ represent 0.5 or 50% opacity. CSS opacity and RGBA are one of the most widely used properties used extensively across websites for fading animations and transitions to build modern and attractive UI designs. Even though opacity property and RGBA color value enjoys excellent support across all major browsers and versions, there are still small compatibility issues when it comes to Internet Explorer 8 and below. But now you are armed with this flawless cross browser compatible solution for opacity to ensure that your designs work seamlessly across all browsers.